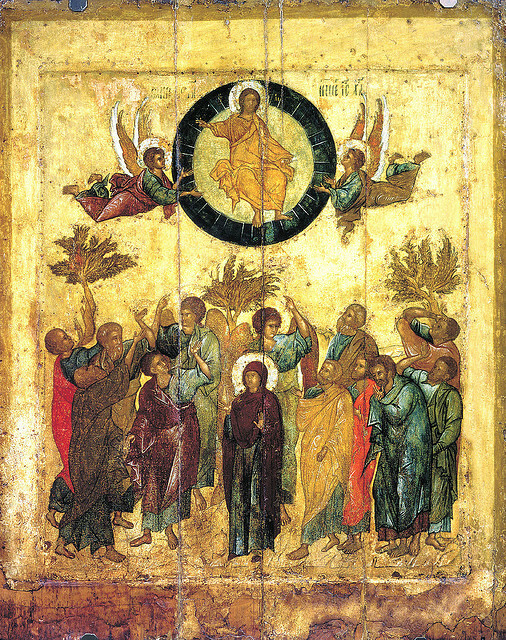 Compared to other, non-creedal things like Hell, homosexuality, and “attacks on biblical authority”, the Ascension isn’t really talked about. Maybe this is because the Ascension isn’t really a “doctrine”–it’s an “event” and a “declaration”. And we western Christians love our systematic “doctrines” that we can pick apart as nauseam and/or figure out how we can “apply it to our lives” in such a way that we can feel like we’re “good Christians.” But honestly, the Ascension doesn’t have many direct applications for today. The earliest Christians in Scripture appealed to this event as the primary proof of Jesus’ divinity and “lordship”, but beyond that, the Ascension can be seen as not very “useful”. There’s not much we can “do” with it. Which is precisely why it’s so valuable (just like God’s Beauty). More than many other aspects of the Gospel and Christianity, the Ascension isn’t an “idea” to mull or unpack, but rather “news” to receive. There are some beautiful aspects to it, though, that I’d like to point out on this Ascension Day, to help us meditate on it and rest in the cosmic beauty of this reality. You have set your glory above the heavens…. you have put all things under their feet…. In this one Psalm, there is both an expression of God ascending his glory above the heavens, as well as ascending humanity above the rest of Creation so that “all things [are] under their feet” (sound familiar?). Though this Psalm is clearly talking about how humans in general are the ones ascended above Creation, the author of Hebrews interprets these verses as talking about how Jesus specifically is exalted and ascended above Creation. I don’t think we have to choose here. I think these are both revealing different truths in the same words. Ascension isn’t just something God does “for” us in Jesus, it’s something he does “to” us in Jesus–it’s something we can taste and experience and know. It’s something that we can participate in as people joined to the Creator, Ruling, Lording God. And this is a present truth, not some possible truth waiting for our right response, behavior, or maturity–it’s the good gift of a good God who loves us and invites us into his own experience as God. [God’s] great might…worked in Christ when he raised him from the dead and seated him at his right hand in the heavenly places…. And he put all things under his feet and gave him as head over all things to the church…. Throughout the Bible and the ancient world, one’s “right hand” was the active, willful part of a person It symbolizes the part of one’s self that turns their intentions into action. This is the significance of the whole “right hand of God” part to this idea. I know that the Scriptural order and chapters and verses are not “inspired” and were established well after the Bible was “canonized”, but this is too much fun not to share. Psalm 119 is the longest chapter of the entire Bible. Psalm 117 is the shortest. Right between those two psalms is Psalm 118 (duh). But the fun part is this: Psalm 118 is the exact middle of the Bible. And what are the middle verses of this middle chapter? What are the words that act as the hinge of the Bible? I was pushed hard, so that I was falling, but the Lord helped me. and recount the deeds of the Lord. I could not think of a more beautiful and succinct summary of redemption’s story. Though the enemy had pushed us (that’s what the Hebrew implies), and we were falling, the Lord has “become” our salvation in Christ. Jesus, the one ascended to the right hand of God, has done valiantly and has exalted us. And so we sing as those made righteous by his acts. And finally, we have the privilege of being among those who will not die, but will live eternally, recounting the deeds of the Lord, exalted and ascended to his right hand.